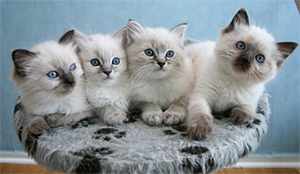 This litter contains four kittens and they are born 25th of May 2007. 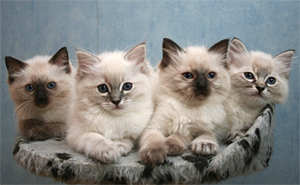 All the kittens have as usual been named after songs from the Eurovision Song Contest (links behind the title). 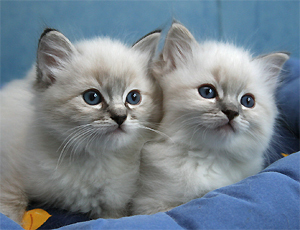 This time we have chosen songs from the Eurovision Song Contest held in Estonia the 25th of May 2002 as the theme for the litter. The boy has been named "S.A.G.A.P.O." [Greece 2002] and he is seal lynx colourpoint. 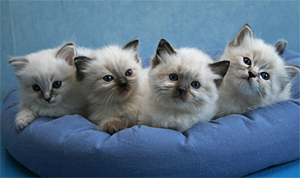 The seal colourpoint girls have been named "Seventh Wonder" [Malta 2002] and "I Wanna" [Latvia ESC-winner 2002]. 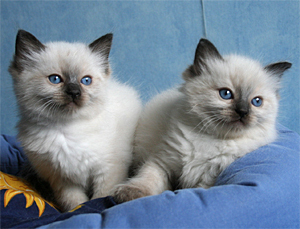 The blue lynx colourpoint girl has got the name "Happy You" [Lithuania 2002].